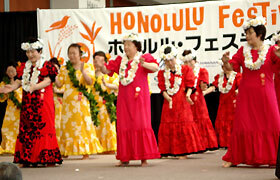 There were performances of various cultures held on the Festival Stage at the Hawaii Convention Center. They include the Hawaiian music, hula dance and a live performance by Moana DNA which is a popular band among the locals in Hawaii. 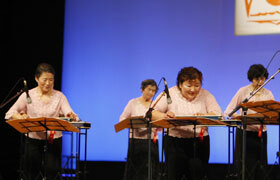 In addition, the Japanese performances such as the koto and taiko drumming were performed as well. Furthermore, one of the anticipated plays this year, the Daidengaku and Tenshu Monogatari was performed on stage, which co-starring Manzo Nomura who is the Kyogen performer and Keiko Matsuzaka, who is a famous Japanese actress. 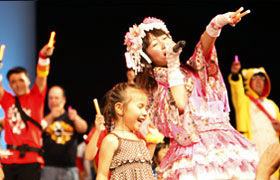 The live performance by Haruko Momoi known as “Momo-i” of the Akiba idol was also held on the same stage. Also, a lot of audience gathered in curiosity by the stage during the powerful performance of the Izanai dance by Sugaizanairen. Sugaizanairen is a group from Kochi Prefecture and they have been participating since the first Annual Honolulu Festival to the present, which this year will be their 15th time. Their performance created an atmosphere of the Japanese festival unlike last year which the show began with a mysterious vibe. Mr. Donna from Canada was impressed and said “It was such an energetic and wonderful dance!” Ms. Kunitomo, who is the leader of Sugaizaniren said that they are participating the annual Honolulu Festival for the people who are looking forward to watch their performance every year. 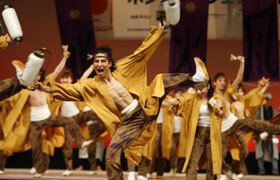 The yosakoi dance by Sugaizanairen performed with a fast tempo this year. Their performance is always powerful. The Japanese actress Matsuzaka Keiko performed professionally. A lot of people gathered to watch her show. They are the members of Music Line Kotomu. It is a time to show their effort of daily practice on a big stage. 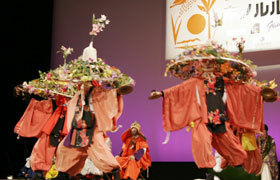 The performance of the Daidengaku consisted of dancers from Hawaii and Japan. 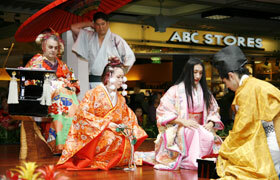 It was a valuable opportunity to watch one of the Japanese traditional arts in person. They are the members of Leilani Hula Studio. Every movement of the dancers was elegant and gracious which was impressive. 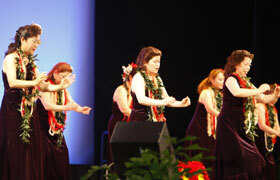 The Festival Stage 2 was set up in a spacious area at the Hawaii Convention Center, since there were more participating groups than last year. There were various traditional performances from the countries of the Asia-Pacific region including Japan, Hawaii, Vietnam, Korea and Philippines. 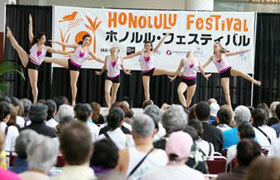 The Festival Stage 2 became a place that represents the sub-theme of this year’s Honolulu Festival “Heart of the Pacific, Creating our Future” which hopes to expand the activities of cultural exchange in a major way. Also, Ibaraki City Dance Drill Team World Wings watched the performance of Dance Junction Hawaii in the morning of Saturday, March 14. Afterwards, they deepened their friendship by taking pictures and exchanging gifts to each other. Dance Junction Hawaii is a baton twirling team in Hawaii, which performed such a well-formed dance. The members of ALOHA Diamonds appeared in a colorful costume. We can tell that they are genuinely enjoying their hula dance. 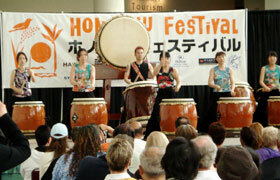 The sound of the Japanese drums resonated throughout the Hawaii Convention Center. You can also feel the vibration. 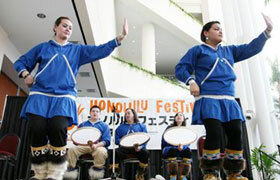 The members of the Alaska Native Heritage Center Dancers participated for the first time this year. They performed the Alaskan dance which reflects the nature and life of Alaska. Montessori De Cagayan from the Philippines. 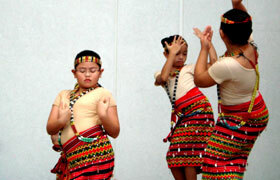 Their waist and hands were moving meticulously, which you can’t imagine that they are still the child dancers. 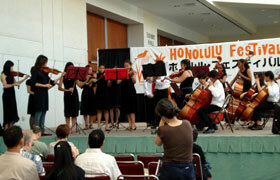 The members of Kawananakoa Chamber Orchestra. Their beautiful timbre of string instruments resonated throughout the venue. 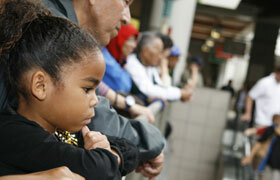 A lot of guests gathered by the stage of Ala Moana Center even though it was a cloudy morning. 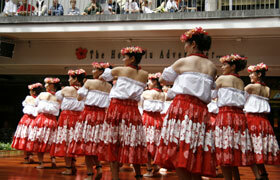 The first performance was the hula dance by the members of Leilani Hula Studio which was gorgeous. They were perfectly in tune with each other and their colorful dress brightened the cloudy sky. As the weather started to get better, more guests came to watch the stage, where there was a lot of excitement. Ms. Arbaeen who came to Hawaii all the way from Czechoslovakia said that this event was a wonderful opportunity to watch many performances of various countries all at once. Also, Win Sisters, Phuck and Mia came to visit Hawaii for 2 weeks from Connecticut. They discovered about the Honolulu Festival from the advertisement posted on the bus, which they came to watch the performance. One of them said “We went to the Hawaii Convention Center in the morning. The Japanese chigire-e (torn paper) and making sandals from the old-T-shirts were impressive. Also, we tried the okonomiyaki for the first time which was tasty. 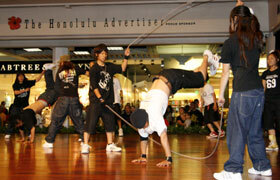 Then, we wanted to see other performances so went to Ala Moana. We are planning to go see the parade with our mother tomorrow. There’s so much to see and we are enjoying very much.” In addition, they sat on the very first row and enjoyed watching the performances. The hula dance by Obama Girls and Obama Boys was well-formed which reminded of the Japanese film “Hula Girls”. Ritsumeikan University dig up treasure continuously showed some complex acrobatic skills. The audience came up on the stage for a challenge. 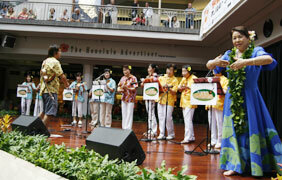 The stage of the Ala Moana Center was crowded with a wide range of age groups. The Nippon Sport Science University Cheerleading Club VORTEX is one of the best cheerleading groups in Japan. Their splendid smiles cheered the audience. The members of Jujube Oilan from Hawaii were wearing a beautiful costume. The members of the Ukulele Studio MAHANA played smoothly on ukulele.